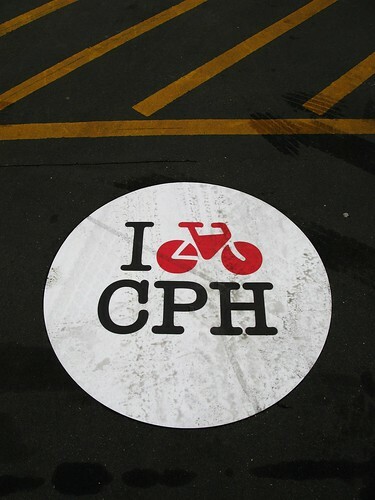 The City of Copenhagen is testing out some new street stickers to be stuck on the bike lanes. They have tried them out before, as posted here, and these stickers with the city's bike department logo will be used to further brand Copenhagen as a cycle city in the hearts and minds of Copenhageners. Before you ask, no, they're not slippery. They wouldn't put them on bike lanes if they were slippery. This sticker is in the parking lot behind the Transport Dept's offices and it is being tested to see how long it lasts and how it holds up under bike wheels. The employees ride over it each day, skid on it, you name it. All very cool. It's important for Copenhageners to 'be the brand'. Most don't even think about the fact that they live in a 'bicycle culture'. It'll be great to get more people aware of it and proud of it. It'll help encourage more cycling and it can all be done without doing things that wrongfully brand cycling as 'dangerous'.